What is Dockless Bike Share? As the name suggests, dockless bike share does not require a docking station — an expense that could sometimes limit the number of bikes a city could afford. With dockless systems, bicycles can be parked within a defined district at a bike rack or along the sidewalk. 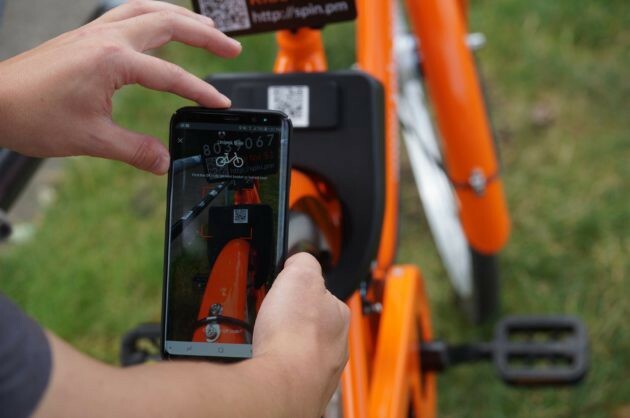 Dockless bikes can be located and unlocked using a smartphone app. Unlocking Spin bike with a smartphone. source: GeekWire. Dockless bike share is designed for short, spontaneous trips. While the cost of using traditional bike share for a single trip (typically, $7/day) could be seen as a barrier to ridership, most dockless bike share models offer single trips for $1. Although $1 per ride isn’t great for multiple trips in one day, it is great for that one way trip for a tourist, to cruise around shortly, or the quick ride to meet friends or ride to a meeting. To address more frequent users, LimeBike offers a monthly package of $30/100 rides. Dockless bike share adds even more convenience for users who no longer need to worry about empty bike share stations at the front end of the trip or full stations upon arrival. However, this convenience for users can be a problem for both system operators (who must rebalance bikes to meet demand) and cities (who must manage a clutter of bicycles on sidewalks already under pressure from competing uses). The wide, scattered nature of operations also poses drawbacks related to maintenance, bicycle durability, economic sustainability, and potential lack of visibility that established stations provide. Misplacement of dockless bikes can be a real issue. To manage parking issues, cities and operators can institute incentives and disincentives as part of a regulatory framework. Several operators like oBike and LimeBike give credit points for returning to bikes to a designated parking location. 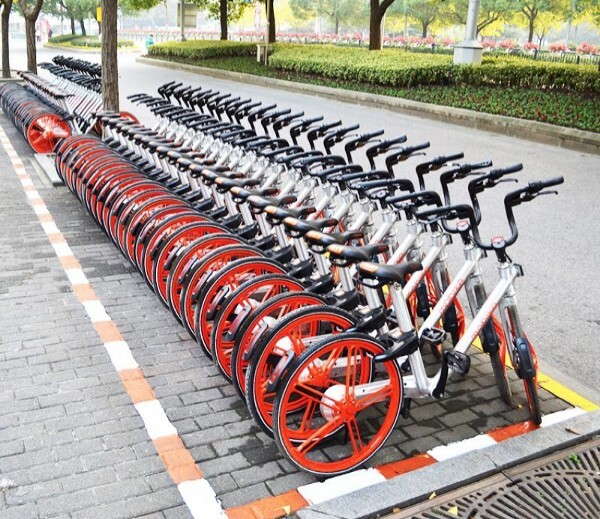 Mobike, which operates more than five million bikes and has 100 million registered users (taking 25 million trips per day at peak times), encourages users to park at Mobike Preferred Locations (MPL) and provides bike parking best practices on their website. 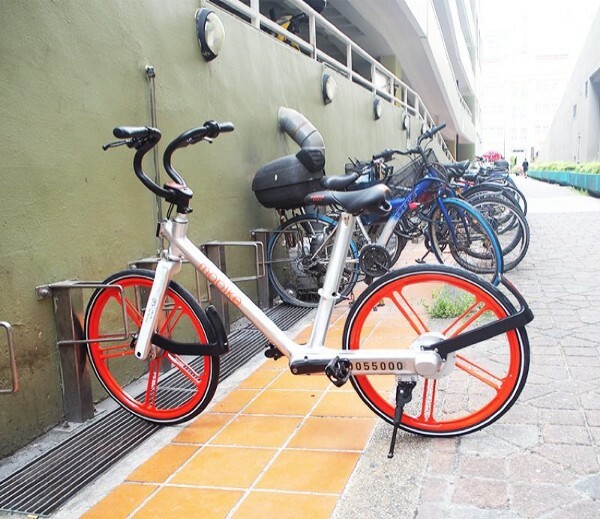 The company also offers incentives for reporting bad parking practices, stating in their company FAQ, “If you see any illegal or poorly parked Mobike, please send us feedback and you will be rewarded with Mobike Credits. Mobike Preferred Location and bike parking example via Mobike. Early dockless bike share operators did not consult with cities, but rather distributed bicycles in cities like Austin, Texas without permission (or even an early warning). Most operators now know they must work with cities to manage the launch and growth of a system. While adding complexity, dockless bike share systems, such as Jump, Spin, and LimeBike, pose both benefits and challenges. Coordination between cities and operators is key for successful systems. Seattle, which suspended its first bike share system Pronto, is now working with Spin and LimeBike, two popular dockless systems that launched mid-2017, and Ofo, a third dockless system that launched on August 18, 2017. Spin has worked with the City of San Francisco on a sequential series of launches to test and manage system growth. In Greensboro, North Carolina, LimeBike worked with the University of NC- Greensboro first on a campus, and later, with an expansion into the city. LimeBike is also working with a Business Improvement District in South Bend, Indiana. Because of the added complexity, dockless bike share requires a planning approach that’s a win-win-win for users, cities, and operators. Read next: Six steps cities, towns, and university/corporate campuses can take to get started.